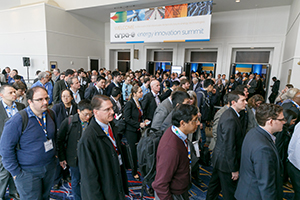 The Student Program at the ARPA-E Energy Innovation Summit is a unique opportunity for student energy leaders to engage with companies looking for new talent, as well as learn about new energy initiatives. The graduate-level students selected to participate in the Student Program receive complimentary registration to attend the Summit, participate in student-focused panel sessions, and network with corporate recruiters. Who participates in the Student Program? We expect a diverse mix of technical, scientific, business, and policy students from top institutions, who are energy leaders on their campuses and have the goal of transitioning to a professional career in the energy sector. How do I apply to the Student Program and what information will be needed? Admission to the Student Program is restricted to graduate-level students at accredited institutions. The application period is now closed. What is included in a Student Program Registration? Accepted students will receive a complimentary student registration pass to the Summit. Each participant is responsible for making and paying for his/her own travel and hotel accommodations. What are the application due dates and when would I be notified of acceptance? How can my company participate in the Student Program? For companies interested in the Student Program, participation is at no additional cost to your Summit registration. Participating companies will receive a digital resume book in advance of the Summit with the resumes of the Student Program participants and a table at the Student/Company Networking Reception that will take place at the Summit. An email will be sent to all Summit registered companies in the spring of 2019 with more information on how to participate.